If you are looking for an in office solutions to professionally wire bind your documents the 4000W2 is a system to consider. 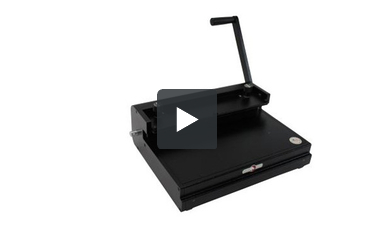 The 4000W2 is a 2:1 electric wire binding system. The 4000W2 features an upgradeable modular punch, a 2:1 square wire die, a manual 14" flat bar wire closer and a mounting kit. Mybinding part number 4000W2. Welcome to MyBinding video. This is the ONYX 4000PLUS, an 11" Open-ended interchangeable punch by Rhin-O-Tuff. Backed by a solid 3 year warranty, this is a great punch. Step by step, let's watch it in action. For this video, we'll use spiral coil. However, there are dice made for wire and plastic comb as well. The side margin control knob is solid, sturdy, and will not let you down. The markings on the die as well as the machine itself help you measure exactly the right size you need. To initiate the punch, you use the pedal either by foot or by hand. Using the scratch paper, we can see that our holes are lined up. There are no half holes or miss-punched holes. But oftentime, adjustments must be made for different sized papers or different styles of projects. Simply remove the two screws on the front of the machine and out pops the die. And this is where the Rhin-O-Tuff's interchangeable die system is in full effect. Not only can you change dice but every single pin in each die is fully disengageable. Simply removing this top bar and selecting any pin that you'd like, it slides right out. The entire die is labeled so selection of the right pin is very easy. They slide in and out with great ease. Replace the carriage, slide the die back in the machine, lock it down, and you're on your way. Beginning with the covers of this project, we'll make our first punch. We find that everything is just the way that we like it. We can continue through the entire project making punch after punch of up to 20 sheets of 20 pound paper in a single punch. With everything punched and ready to go, assemble your project together, it's time to bind. With spiral coil, you initiate the coil onto the spine by hand by twisting it right through the holes. And you can continue to do so all the way through by hand or use a coil inserter. And finally with a pair of coil crimping pliers, crimp one end and then the other and you're all set. These pliers both cut and crimp the end so it does not come apart. And that's it. That's the ONYX 4000PLUS by Rhin-O-Tuff. For more demos, reviews, and how-to's, check out MyBinding.com. Welcome to MyBinding video. 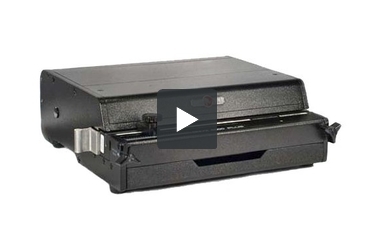 This video looks at the Rhin-O-Tuff Onyx HD8000 wire closer, a wire binding module. It's a standalone unit or it can be combined with other Rhin-O-Tuff Onyx punches. When your project is all punched, you need to bind it. And the Onyx HD8000 makes closing the wire fast, accurate, and simple. With the correct size wire selected and your book in order, begin by flipping the back cover around to face the front. This way, in the end, the seam of the wire is hidden between the back page and the back cover. Next, thread the wire onto the spine of the book. If you haven't done so already, now is the time to adjust the depth of the wire closer. The two dials on the top allow you to accurately set the depth of the wire closer. Then with the opening of the wire that forms a “C” shape, place it all the way to the back of the closer and bring down the lever. Remove your book and you're all done. Another great-looking project with the Onyx HD8000 by Rhin-O-Tuff. For more demos, reviews, and how-tos, check out MyBinding.com. What is the maximum number of sheets this will bind in the 2:1 wire bind configuration? If you are using standard 20# copier paper the 1 1/2" (which is as big as they come) 2:1 twin loop wire spines can accommodate up to 310 sheets of paper.